I'm really lucky to live where I live. I don't need to track food trucks on Twitter. They come right to me. 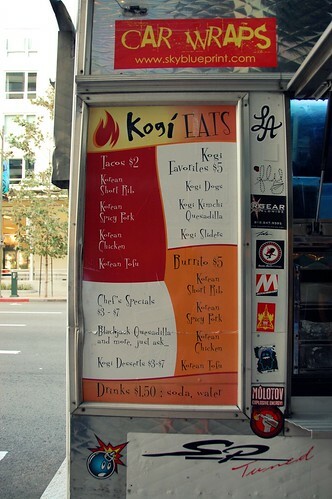 I was excited to finally try the one and only Kogi, the original spiffed-up, non-roach-coach food truck. Chef Roy Choi and his mobile Korean-Mexican cuisine are veritable media darlings, having been featured in Time, Gourmet, Bon Apetit, Food & Wine, and The Wall Street Journal. Kogi is a new institution. I felt like I was the only one in all of L.A. who hadn't sampled it. 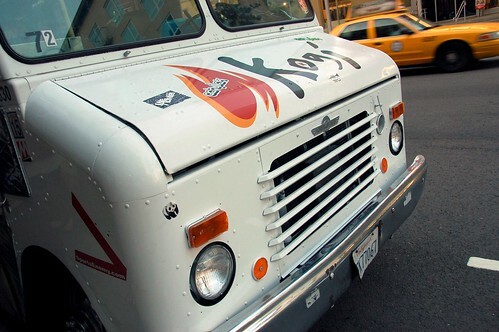 I'd heard tales of serpentine lines and hour-long waits for Kogi. Not for me. Again, lucky! Here's what started the food truck craze -- Korean short rib tacos and Korean spicy pork tacos ($2 each). I can see how these little babies could draw throngs of fans. Good flavorful stuff, but I still wouldn't Twitter-stalk or wait in a long line for them. Really great with an excellent snap. Liked it even more than the tacos. 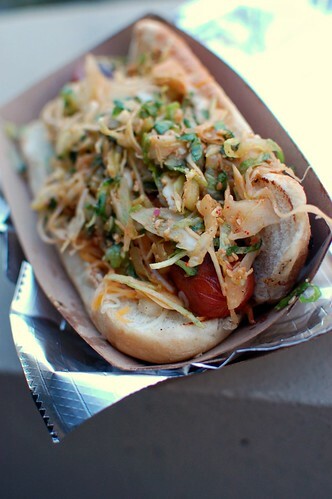 But this was nothing compared to the Japa Dogs I had in Vancouver last year. Easily my favorite of the day. Smoky, yummy, and cute. No shortage of meat. Just so it's clear, I didn't eat all of this. Mr. Monkey ate most of it! So you finally tried it. Won't blame you if you ate all of those, they look absolutely worth the calories. And the big tummy-ache after. I love your versatility. 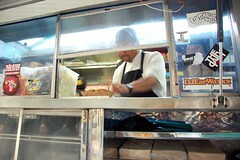 From The Bazaar to the the food trucks. I wish we had food trucks in Chicago. 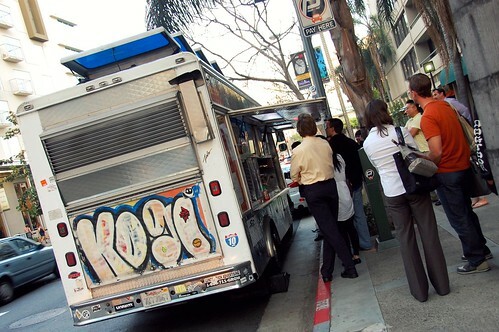 I really like Kogi, but over time, I've liked them less and less. Glad you finally got to try them. And SCORE of Chef Roy actually being there. now i'm really the only person in LA that hasn't tried it. i may this weekend, though. uh oh. i haven't had them in a long time. seems like their products are still going strong though. mr. monkey must be stuffed! After Tater tries it, I'll be the only person who hasn't. Is the slaw on top of everything very kimchi-like? If it is, I probably won't like Kogi very much. Not a fan of kimchi. I know I'm a disgrace to my motherland. i haven't tried it either, but i don't count since i live in BFE. I love your disclaimer about Mr. Mo eating most of it. 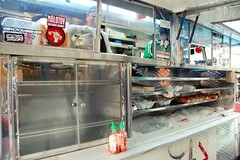 *sigh* I dream of the day I don't live an hour away from cool food trucks. I'm shocked you hadn't tried it yet! I agree, those are the best things to order, and we're lucky that they are in our neighborhood pretty often. Haven't had it in a while! i've only had kogi once and i thought it was just so delicious. no i wouldn't wait in line forever for it, but it is definitely a welcome treat. 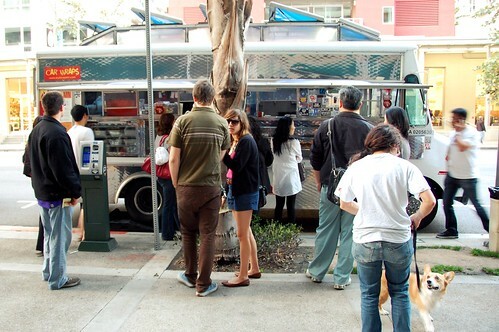 I wouldn't wait in line for Kogi. The only times I've had it are late Thursday nights when they happen to be on frat row haha. They're good but the satisfaction significantly decreases after the first few bites for me. 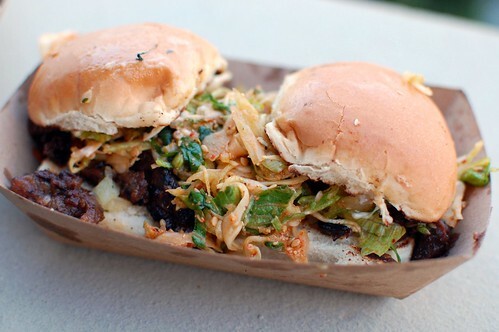 Your pictures are making me crave a short-rib taco right now though! I wish it would drive up to my door! I've only had the knock-off Kogi truck, and they didn't have sliders! I wonder when the truck craze will find it's way to my south OC suburb. The ice cream man just doesn't cut it. Hi KogiMonkey, there was a huge discrepancy between the first time I tried it and almost 8 months later. The first time was handmade by Roy himself... but the last time was simply awful. A chef's hand is so important. I'm lucky yet again! Roy was manning Rojo that day! And, yes, venn, that stuff on top is kimchi-like, but not very strong at all, if that makes sense. I still have not been to Kogi! Maybe one day I'll try it, but you know how I feel about tracking down my food thru Twitter. You're so lucky they stopped so close to where you live! Still haven't tried Kogi. And to be perfectly frank (like a hot dog), I don't really want to try it! I'm saving myself for Dim Sum, Flying Pig and World Fare next. This reminds me of the dumpling truck that people used to chase all over Manhattan. I finally tried it and was happy, but it didn't seem worth the wait. Hehe. Ahhhhh I love you blog! But you didn't try the kimchee quesadilla, what's the deal?!! great review. i unfortunately have not had a chance to try these food trucks...for obvious reasons (pointing to menace of a wife looking over my shoulder). A Kogi truck made its way to my work complex for the first time on Wednesday! My co-workers and I waited 1.5 hours for these yummy tacos and sliders. The slider was easily my favorite too. I still haven't tried it either. Heh. 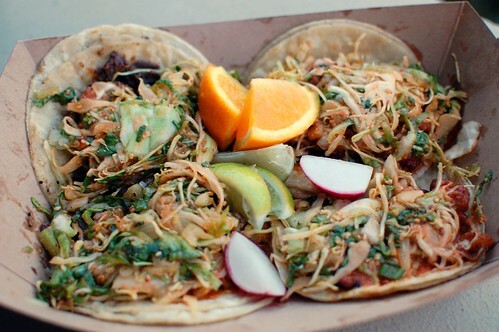 The tacos look delish! Better late than never! I really like their shortrib burritos and kimchi quesadillas.